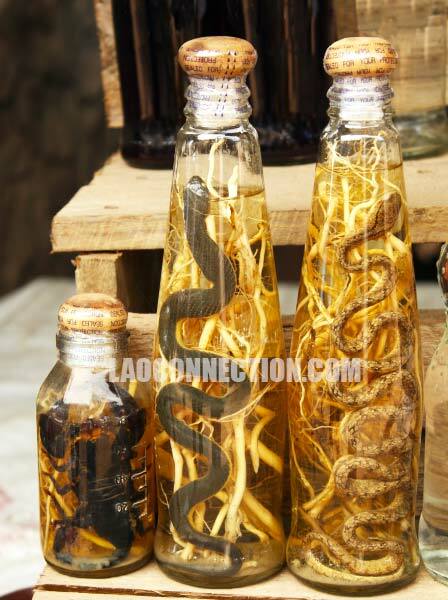 In Laos, as well as, other Asian markets you'll often see snakes in alcohol filled bottles. And so it sometimes goes by the name of snake whiskey. In some parts of Asia you'll even find scorpions or salamanders in the bottles. It's said to be medicinal. However, that of course is highly questionable. For others, it's considered more of a sign of strength if you can dare to stomach taking a shot. In Laos, some of the bottles were made locally and others were found to have been imported. Additionally, the idea of it gets mixed feedback from both foreigners and Lao people. While some people might find it peculiar and interesting to look at, others are simply grossed out by it. How do you feel about it? Would you ever try a shot of it?